Also known as Methi, Fenugreek (Trigonella foenum‐graecum) is one of the oldest known medicinal plants, dating as far back as 1500 BC. It has a unique flavor and aroma, which comes from the compound Sotolon. 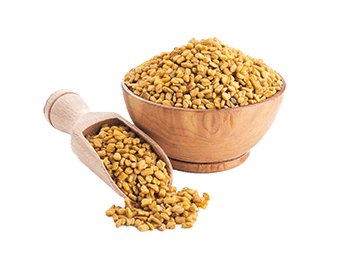 Fenugreek seeds boast many nutrients including protein, lysine, L-tryptophan, pyridine alkaloids (trigonelline), flavonoids, amino acids, sapogenins, vitamins and volatile oils. Certifications:Organic, Kosher and Food grade.